If you think that mobile phones require you to be available all the time, your Galaxy S6 has a solution for you. 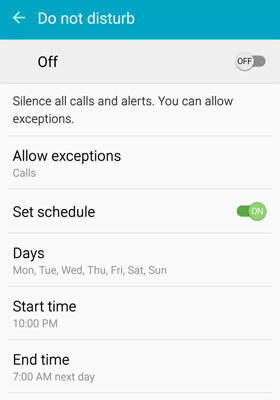 You can go to Settings, select Sounds and Notifications, and tap Do Not Disturb. This turns off the ringer and all notifications until you turn notifications back on. You are in total control. But what if you are sometimes forgetful and neglect to turn the phone back on? No need to worry. You have a number of options that you can easily program into your phone. First, you can set a schedule for Do Not Disturb. You could set it so that it will not bother you during sleeping hours. The figure shows the set schedule so that this phone will not be disturbed from 10 p.m. to 7 a.m. seven days a week. The phone will not make a peep at night. Schedule for Do Not Disturb. Hold on. What if you use your phone as your alarm clock? No problem. Tap the link to Allow exceptions. That takes you to a page as seen here. You have the choice to allow alarms. 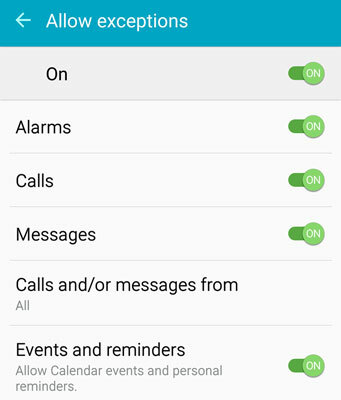 Toggle that option on, and you will get your wakeup alarm. Of course, if you toggle on all the exceptions, you defeat the whole purpose of the Do Not Disturb capability. If you limit your Favorites to a few people, such as close family members, you can let in their calls and keep out any solicitors that have guessed your number. That sounds like a great plan.